336 pages | 2 B/W Illus. This book highlights the role of emotions in the contentious politics of modern South Asia. It brings new methodological, theoretical and empirical insights to the mutual constitution of emotions and mobilisations in India, Pakistan and Bangladesh. As such, it addresses three distinct but related questions: what do emotions do to mobilisations? What do mobilisations do to emotions? Further, what does studying emotions in mobilisations reveal about the political culture of protest in South Asia? The chapters in this volume emphasise that emotions are significant in politics because they have the power to mobilise. They explore a variety of emotions including anger, resentment, humiliation, hurt, despair, and nostalgia, as also enchantment, humour, pleasure, hope and enthusiasm. 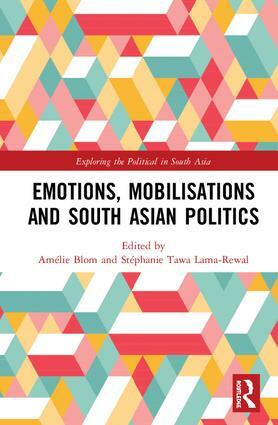 The interdisciplinary research presented here shows that integrating emotions improves our understanding of South Asian politics while, conversely, focusing on South Asia helps retool current thinking on the emotional dynamics of political mobilisations. The book offers contextual analyses of how emotions are publicly represented, expressed and felt, thus shedding light on the complex nature of protests, power relations, identity politics, and the political culture of South Asia. This cutting-edge research volume intersects South Asian studies, emotion studies and social movement studies, and will greatly interest scholars and students of political science, anthropology, sociology, history and cultural studies, and the informed general reader interested in South Asian politics. Amélie Blom is part of Adjunct Faculty in Political Science at Sciences Po, Paris and at the National Institute of Oriental Languages and Civilizations, Paris, France. Her research addresses the politicisation of Islam in Pakistan, particularly in Punjab. Her publications include The Enigma of Islamist Violence (2007, co-edited with L. Bucaille and L. Martinez) and ‘Emotions and the Micro-foundations of Religious Activism: The Bitter-Sweet Experiences of "Born-Again" Muslims in Pakistan’ in Indian Economic and Social History Review (2017). Stéphanie Tawa Lama-Rewal is a National Centre for Scientific Research (CNRS) Research Fellow at the Center for South Asian Studies (CEIAS), Paris, France. She studies political representation, local democracy and urban governance in India. Her publications include Democratization in Progress: Women and Local Politics in Urban India (with Archana Ghosh, 2005) and Governing India’s Metropolises (co-edited with Joël Ruet, 2009). Exploring the Political in South Asia is devoted to the publication of research on the political cultures of the region. The books in this Series will present qualitative and quantitative analyses grounded in field research, and will explore the cultures of democracies in their everyday local settings, specifically the workings of modern political institutions, practices of political mobilisation, manoeuvres of high politics, structures of popular beliefs, content of political ideologies and styles of political leadership, amongst others. Through fine-grained descriptions of particular settings in South Asia, the studies presented in this Series will inform, and have implications for, general discussions of democracy and politics elsewhere in the world.